Recently it seems I have had to fill out a ridiculous number of forms that all require me to write down my status…single, married, divorced, widowed… It’s amazing how much I want to deny my actual status. 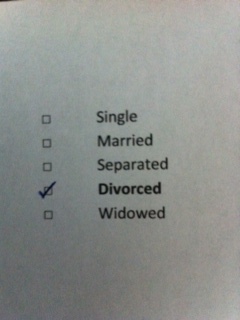 Who would have thought I’d ever wish I could check any box but divorced? Just being honest. I feel as though I have a giant D plastered to my front, my back, my forehead and everywhere in between. As a Christian, it’s particularly difficult to come to terms with this life status. It is an epic failure. I’m getting used to it…I guess. In the past several weeks I’ve been to more medical/dental appointments than I thought possible. And at each one those blasted clip boards with those horrid forms are handed to me. And each time I have to reaffirm that I am divorced. And each time I want to add a posted note with the circumstances of my divorce. “Divorced due to the adulterous actions of my husband…blah blah blah.” But why? It doesn’t really matter anymore. I have forgiven him and I don’t want to malign him any more than his actions already have. I have peace in my heart about what God is doing in my life. And yet, I cannot deny that it feels crummy being a divorcee. No matter how many of us there are out there, it stills feels like a tragic life circumstance with a definite negative stigma attached. But in all honesty, that crummy feeling is because I’m trying to find my identity in something that isn’t ultimately going to give me any peace or even a good perspective. My relationship status – married, single, separated, divorced, widowed – none of those truly are who I am at the core. Does that make sense? It is a circumstance in my life not me at my most defining point. Although even as I write that I know that there is more to it than that. There is a depth to marriage that makes it so much more than just my relationship status…maybe that’s why divorce feels so shattering. As much as I want it simply to be a box I check or don’t check…it feels like so much more. Married is how I have wanted to describe myself since I was a little girl. It was my most anticipated adjective. I had it for a long while and then, in what felt like an instance, it was gone…my adjective was replaced with one I really don’t like much at all, but I have long ago accepted this new adjective to describe me…not happily or without a bit of fussing. But today I have decided to focus on other things that I prefer much more. I bet a bunch of them describe you too. I made this list in preparation for a talk I did at a ladies’ retreat…it blessed me to be reminded of who I am in Christ…I pray it blesses you too. Each one of those descriptions speaks to my heart and mind…reminds me of who I am and Whose I am. There is always hope. Dearest, you are loved beyond measure. And certainly not a little box on a form. Wow! I am fairly new at this single mom thing. This post spoke to me SO much! Thank you, thank you for writing it. I just recently had to fill out an application for my son to go to a private school (after homeschooling for 3 years, I have to go back to work, which means he has to go to school). There they were… The boxes. “Check one.” Everything in me wanted to check “married” but I couldn’t. I had to check “separated.” I broke down and cried. Talk about a reality check! And not a good one. Anyway, just wanted you to know how much I enjoy your posts. It really does help just knowing there is somebody out there who relates to what you are going through. Good luck and may God bless you and your children!